Ideas are like seeds – they may start small, but with the right support can grow bigger than anyone imagined. For Rebecca Sherbino and Colleen Graham of Paris, one of those seeds blossomed into The Raw Carrot Soup Enterprise, a not-for-profit social enterprise that combines business entrepreneurship with social change. While volunteering at the Paris Presbyterian Church, Colleen and Rebecca noticed a theme – people accessing programs did not want handouts; they wanted jobs. Many people they served had limited education or struggled with mental health, addictions, learning disabilities, illness, and personal or family disruption. Jobs they qualified for tended to be fast-paced and service-oriented with little flexibility for time off, which meant with their unique needs, they could get the jobs but not keep them. 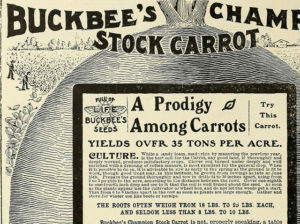 After some brainstorming, Rebecca and Colleen hit upon a “soup-er” idea – and The Raw Carrot Soup Enterprise was born. 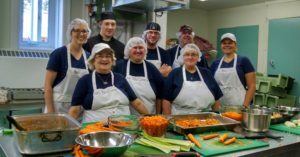 The Raw Carrot uses a combination of volunteers and paid employees to produce nourishing soups and breadsticks which are available on site and at several markets and grocery stores. The model is simple: Employees must be recipients of Ontario Disability Support or living below the poverty line. With the help of volunteers, staff learn kitchen skills along with soft skills like communication, teamwork, and professionalism. Volunteers fill in where needed to allow staff flexibility when facing challenges in their lives – flexibility that is hard to come by in traditional business. Colleen points out that staff turnover since The Raw Carrot opened has been zero. Staff take pride in their work, requesting more hours and fighting good-naturedly over who will work at off-site functions. Funding has come from various sources, including grants through the Presbyterian Church in Canada and The United Church of Canada Foundation’s Social Innovation Challenge. As a social enterprise, all profits from The Raw Carrot must be reinvested into the business and cannot fund other programs at the church. Founders Rebecca and Colleen have stepped away from their careers to manage the program full-time. Benefits for employees don’t end with job skills and a paycheque – despite diverse ages and life stages, staff are a tight-knit group who go to each other and to volunteers for practical and emotional support. Staff recently named their top reasons to come to work: Steady income; a group of friends; and most importantly, a reason to get out of bed in the morning. KARYN PICKLES 2016 Staff and volunteers in the kitchen of The Raw Carrot Soup Enterprise, Paris, Ontario, Canada. Everyone who is part of The Raw Carrot – founders, volunteers, employees, and customers – shares a common goal: The desire to live a purposeful life. Colleen and Rebecca thought of making soup because it was complete, nourishing meal in a bowl – and The Raw Carrot nourishes minds, bodies, and souls all at once. Now that’s an a-peeling thought! An extended version of this post appears at The Huffington Post Blogs.